백자 달항아리는 높이와 몸통의 지름, 입지름과 굽지름의 비례가 조화로운 항아리로서 규모도 크고 보존 상태도 완전한 편이다. 둥근 맛과 양감이 적당하면서 키도 훌쩍 커서 달항아리로서 보기 드물게 시원하고 힘 있는 느낌을 준다. 좌우대칭은 비교적 완전하여 비틀림과 쳐짐이 거의 없으며, 유약은 균열이 없고 단단하여 태토에 완전하게 융착되어 있다. 엷은 회색을 띠는 투명유로서 태토도 약간 회색을 띠고 표면 광택은 우수한 편이다. 입과 굽의 깎음과 몸통 전면을 다듬은 솜씨는 뛰어난 작품이다. 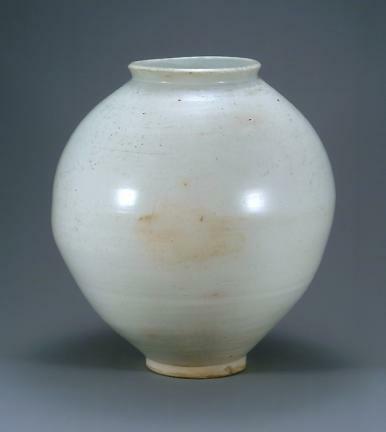 This large fully-intact white porcelain moon jar exhibits the round voluminous body typical of the so-called ‘moon jars.’ It exhibits a well-balanced, stable shape, with the height and the diameter of the body, mouth and foot all in proportion. However, this particular jar is taller than most moon jars, giving it a more robust, solid appearance. The body displays bilateral symmetry with no distortions or irregularities in the overall form. There are no apparent cracks in the glaze, which is tightly fused to the clay body. Both the clay and the clear glaze are a pale grayish color, and the glaze gives the surface a fine luster. The way the mouth, foot and body are shaped attests to the skill and dexterity of the potter.